Thousands of acres of farmland with potato in Lakhimpur’s Dhakuwakhona sub-division are witnessing an abnormal growth of produce affecting dozens of farmers. 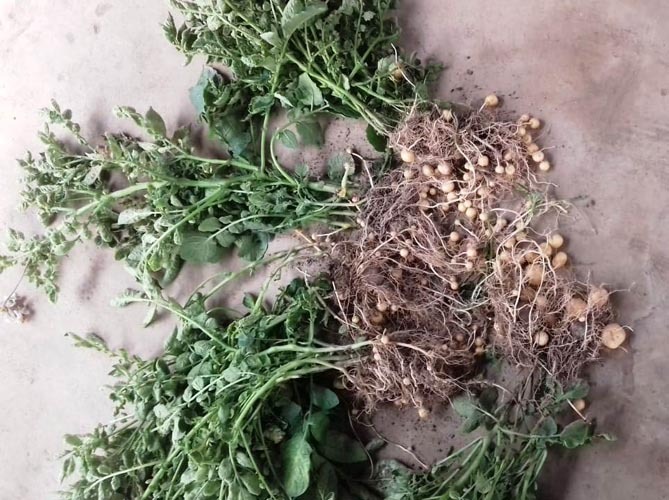 This was found in the potato plantations of Kushal Khanikar (56), a farmer in Kekuri-Bbejia village under Kekuri-Sonari Chapori Gaon Panchayat of Dhakuwakhona sub-division. Showing the newly dug potato bulbs, the farmer expresses his sigh of grief at the size of the products—just tiny little balls. A seasoned farmer Khanikar calls the size of his potatoes the lizard’s eggs—a very tiny size than the average size of the vegetable produced earlier. This phenomenon is now affecting dozens of farmers in thirteen revenue villages of Dhakuwakhona sub-division this time where potato plantations are being affected. Farmers like Rama Saikia, Pushpa Chetia, Lambit Khanikar, Nomal Khanikar and Hari Prasad Saikia fields in Kekuri-Bebejia area are also affected. This has wasted thousands of rupees invested apart from time and hard labour. These farmers who have been growing potatoes for generations say that they have never experienced such a crop failure in their lifetime nor have they heard of such a thing from the past. The tiny size of the potatoes in these plantations was preceded by the shrinking of the potato plants after the spreading of the leaves finally leading to its complete withering. 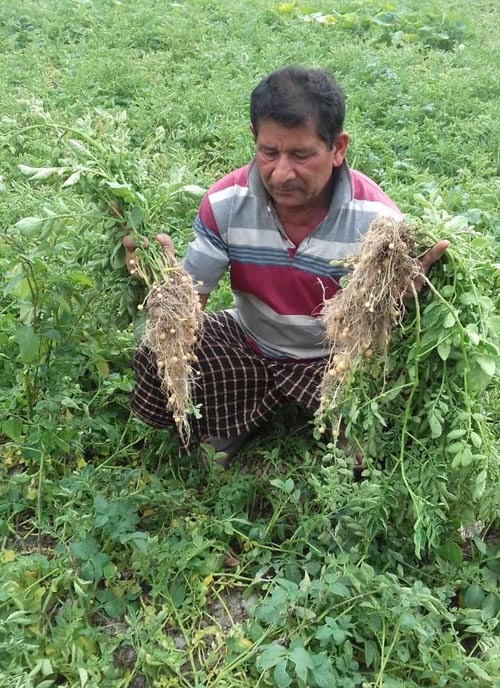 Recalling his observation last year farmer Kushal Khanikar says that the entire potato plantation gets affected following the start of the germination of the seeds. Then the potato leaves shrink after some time leading the plants to die quickly, he says. Last year Khanikar and some of his fellow farmers in Kekuri-Bebejia area could get only 10 to 20 per cent of the production due to the disease in their potato plantations. Reflecting on his observation on this phenomenon, national award winning agriculture entrepreneur and noted environmentalist Jitul Saikia said that rampant use of chemical fertilizers and pesticides by the farmers of Kekuri-Bebejia in past several years have destroyed the natural yield of the soil causing harm to the nutrients essential for plantations like potatoes. The Dhakuwakhona based biologist also ruled out the possible impact of climate change to the potato farming this time. It may be mentioned that the thirteen revenue villages in the entire Kekuri-Bebejia region of Dhakuwakhona along with unmapped villages with 400 households are known to be the potato belt in Lakhimpur district. This time the potatoes were grown in more than 650 bighas of land with minimum 4 bighas and maximum 15 bighas per farmer. But the outbreak of the unknown disease and the small size in production has left these farmers in dire straits needing urgent intervention by concerned departments.